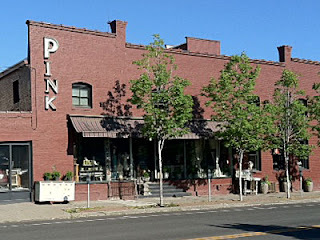 My apologies to the shop, PINK!. I forgot to post that they are donating a portion of their profits as well. PINK! is located at 154 S Madison. They are open 10-4 Wednesday through Saturday. PINK! sells antiques, furniture, art, and more. Although I haven't been there in person, everything I am finding on-line shows this business to be a fun eclectic mix of unique items. I definitely will be adding it to my list of places I must check out. Thank you to this wonderful store for supporting our friend and my apologies for not posting sooner. Thank you to Jenny's Diner for the special fundraiser today. Erin, her dad, her friend Ward, and I shared a delicious breakfast this morning. I would highly recommend any breakfast with their delicious, crispy hash browns. YUM!!! Although, Ward's bacon waffle looked pretty darn amazing, as well. Thank you Colleen and crew for all of your hard work. We had a great time and ate like kings. We would like to thank everyone who came into Jenny's Diner on Saturday. It was an amazing day and it really touched all of our hearts to see how generous EVERYONE was in donating. We ended up raising $900.00 that Saturday. We all really had a great time doing it. We wore our shirts in pride. Plus, what a better way to start the morning than having breakfast with Erin and her friends!!!! Thanks again.